Nordson EFD’s EV Series automated systems include simple vision for precise fluid dispensing using EFD syringe barrel and valve systems. 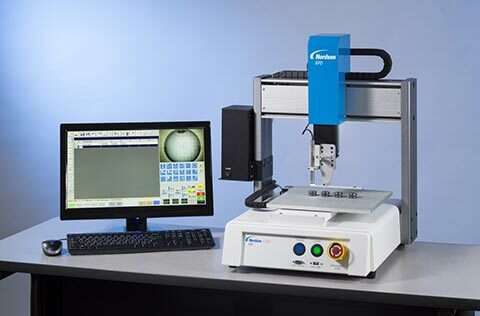 Specialized vision-guided DispenseMotion™ software and a simple pencil camera make EFD automated systems quick to set up and easy to program. True three-dimensional motion control allows easy programming of dots, lines, circles, arcs, and compound arcs. Platforms range from 150 x 200 mm to 570 x 500 mm, making them an ideal solution for batching or critical dispensing applications. The EV Series can work as a standalone system or as a key part of an automated solution and is easily integrated into in-line transfer systems, rotary tables, and pallet assembly lines.